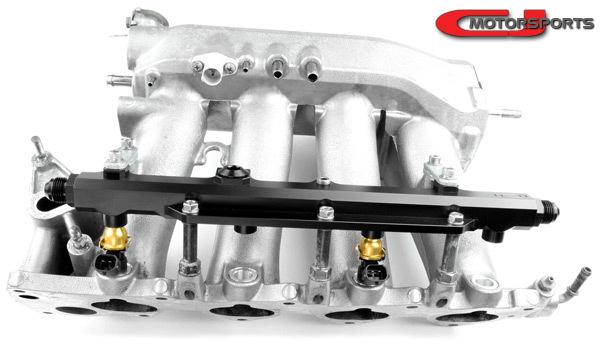 The CJM F20C Fuel Rail features an 11/16" (0.69") bore with -8 SAE O-Ring ports on each end. The top surface of the rail includes 2 accessory ports; 1/8 NPT and -8 SAE O-Ring. 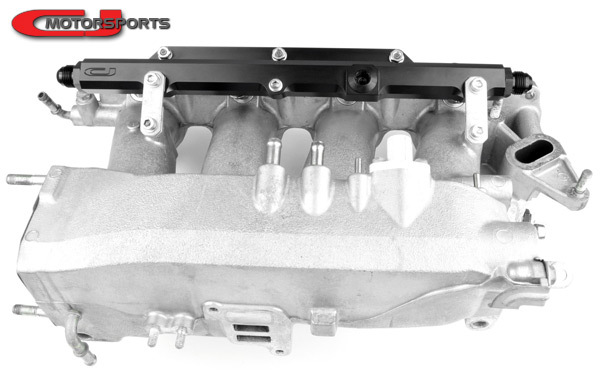 This billet 6061-T6 aluminum rail attaches to the intake manifold using the original 5 mounting points. The 1/8 NPT port is ideal for use with a pressure gauge (optional), or a digital fuel pressure sensor. The top -8 O-Ring port can be used as a center outlet or with an aftermarket pulsation damper (optional). Each rail is packaged with 8AN adapter fittings standard (6AN optional), plugs for both top accessory ports, and stainless mounting hardware. Optionally include fuel injectors with your order to ensure perfect fitment. 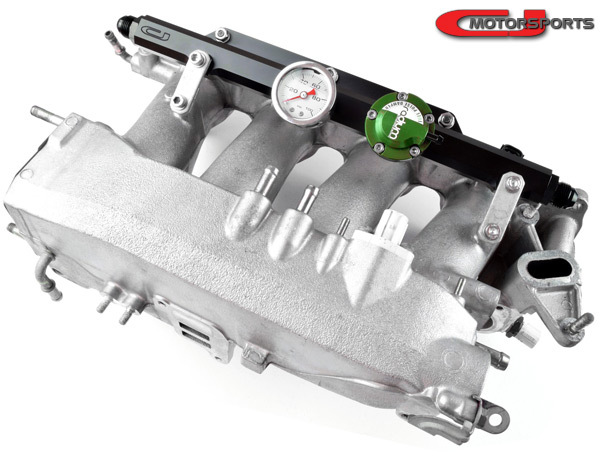 Compatibility and Fitment Information: This product was designed for the 2000-2005 S2000. Fitment to 2006-2009 S2000 is not tested or guaranteed. 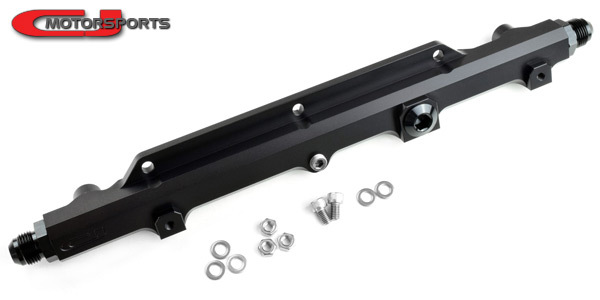 This fuel rail, as shipped, is designed to fit with 48mm body injector (EV14, I.D. 48mm, etc). Appropriate lower o-ring adapters are required, as included with most S2000 specific fuel injector kits. This fuel rail is not compatible with the stock fuel lines, and is intended for custom fuel systems only. EGR Delete Required. Large -8 bore with proper SAE O-Ring bosses. 1/8 NPT and -8 SAE top accessory ports. Billet machined and anodized aluminum construction. Black Aluminum fuel rail fittings and accessory port plugs included. 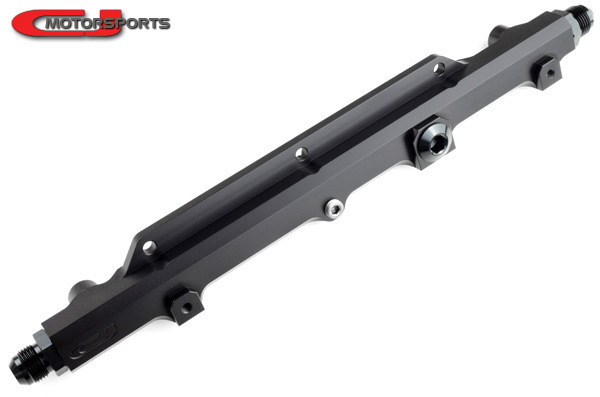 Fuel rail is machined and anodized in USA. 8AN adapters are standard and ideal for extreme applications. 6AN reducing adapters are available for applications where this size is more practical. A compact 1/8 NPT liquid-filled pressure gauge that can be installed to the rails top accessory port. Pulsation dampers can reduce fuel pressure oscillation and contribute to a cleaner, smoother running vehicle. Radium FPD-R is a vacuum referenced damper ideal for 40-45psi base fuel pressure. Radium FPD-XR is a vacuum referenced damper ideal for 43-78psi base fuel pressure. Premium Injector Dynamics fuel injectors, guaranteed to have perfect fitment with the CJM Fuel Rail. Consult us by e-mail, or consult with your tuner, to select the best fuel injector size for your project.